Teach violin with the popular Suzuki Violin School. The Suzuki Method® of Talent Education is based on Shinichi Suzuki's view that every child is born with ability, and that people are the product of their environment. According to Shinichi Suzuki, a world-renowned violinist and teacher, the greatest joy an adult can know comes from developing a child's potential so he/she can express all that is harmonious and best in human beings. Students are taught using the "mother-tongue" approach. Each series of books for a particular instrument in the Suzuki Method is considered a Suzuki music school, such as the Suzuki Violin School. Suzuki lessons are generally given in a private studio setting with additional group lessons. The student listens to the recordings and works with their Suzuki violin teacher to develop their potential as a musician and as a person. 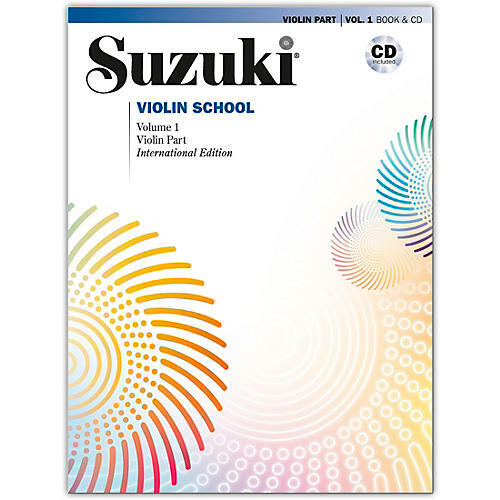 This Suzuki Book & CD is integral for Suzuki violin lessons. This revised edition of the Suzuki Violin School, Volume 1 features: * Revised editing of pieces, including bowings and fingerings * 16 additional pages * Additional exercises, some from Shinichi Suzuki, plus additional insight and suggestions for teachers * Text in English, French, German, and Spanish * Musical notation guide * Fingerboard position * CD with recordings by William Preucil, Jr., accompanied by Linda Perry, as well as piano accompaniments recorded alone. Titles: Principles of Study and Guidance * Twinkle, Twinkle, Little Star Variations (Suzuki) * Lightly Row (Folk Song) * Song of the Wind (Folk Song) * Go Tell Aunt Rhody (Folk Song) * O Come, Little Children (Folk Song) * May Song (Folk Song) * Long, Long Ago (Bayly) * Allegro (Suzuki) * Perpetual Motion (Suzuki) * Allegretto (Suzuki) * Andantino (Suzuki) * Etude (Suzuki) * Minuet 1, Minuett III from Suite in G Minor for Klavier, BWV 822 (Bach) * Minuet 2, Minuet, BWV Anh. II 116 from Notebook for Anna Magdalena Bach (Bach) * Minuet 3, Minuet BWV Anh. II 114/Anh. III 183 (Bach) * The Happy Farmer from Album for the Young, Op. 68, No. 10 (Schumann) * Gavotte (Gossec). For a complete list of the most recent printings by AMPV number, go to alfred.com/suzuki. This title is available in SmartMusic.